Director: Alejandro González Iñárritu. Cast: Javier Bardem, Maricel Álvarez, Hanaa Bouchaib, Guillermo Estrella, Eduard Fernández, Diaryatou Daff, Cheikh Ndiaye, George Chibuikwem Chukwuma, Taisheng Cheng, Jin Luo, Lang Sofia Lin, Ana Wagener, Rubén Ochandiano, Karra Elejalde. 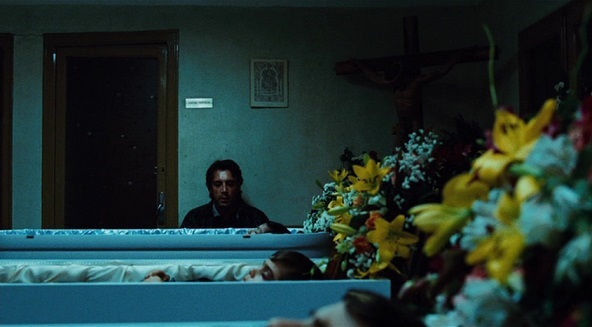 Screenplay: Alejandro González Iñárritu, Armando Bo, and Nicolás Giacobone. Twitter Capsule: (2011) It's a battering ram, sure, but cinematography, sound design, acting, and murky rewrite of social class are very potent. Second Capsule: (2019) Precise themes unclear. Debatably tasteful. But filmmaking is strong in this study of a crowded, confusing, dying world. VOR: ④ González Iñárritu typically invites (and often warrants) accusations of tendentious grandiosity but his aims and craft here feel worthy of review.